A few years ago, Tori and I spent a lot of time in downtown Salt Lake City for her college senior capstone project. At this point in time, I still worked at Starbucks. I had heard of the Rose Establishment from some of my co-workers, so I was pretty stoked to find out we would be nearby. The classic 1918 brick building use to operate as a meat packing plant in Downtown Salt Lake. The interior styling reflects this heritage with it's clean industrial style featuring black steel piping, rich woods, and white washed brick walls. The Rose clearly prides itself as an unplugged community space. The building lacks wifi but makes up for it with its open space, plenty of seating and available board games. The space itself seems to encourage it's patrons to put the phones down, put work away for a minute, and enjoy the company of others. The open layout and tall ceilings feel like they provide room to breathe, to relax and unwind. The natural light provides a calming feel while the tungsten lighting provides a cozy warmth. As the space encourages patrons to unplug and interact, the menu encourages them to slow down and appreciate the intentional. The baristas brew their rotating menu of single-origin coffees from San Francisco's Four Barrel individually and to order. Espresso based drinks come crafted with the same level of care and even have the option of replacing milk with the in-house made cashew milk. The kitchen staff crafts their breakfast and lunch menus and their pastries in-house daily, featuring ingredients pulled from local gardens. To encourage and highlight creativity, the Rose features special drinks concocted by staff. During my visit, I ordered a Kenya Gotomboya brewed on the Aeropress and I love it! 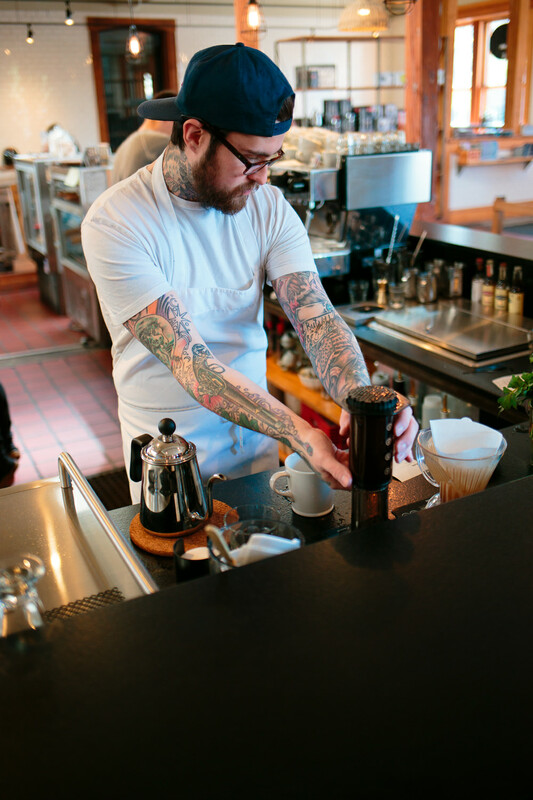 If you find yourself in Salt Lake City and you're ready to take some time out for yourself, maybe share that time with a friend, and enjoy some specialty crafted coffee, you should go check out The Rose Establishment. They also allow their space to be rented out for events such as weddings, so if any of my readers want to get married in a rad coffee shop, check them out, and then drop me a line so we can chat about wedding photography! Visit the Rose Establishment online for more info!